Hands on Activities, Readings, Book Signings, Music and More! 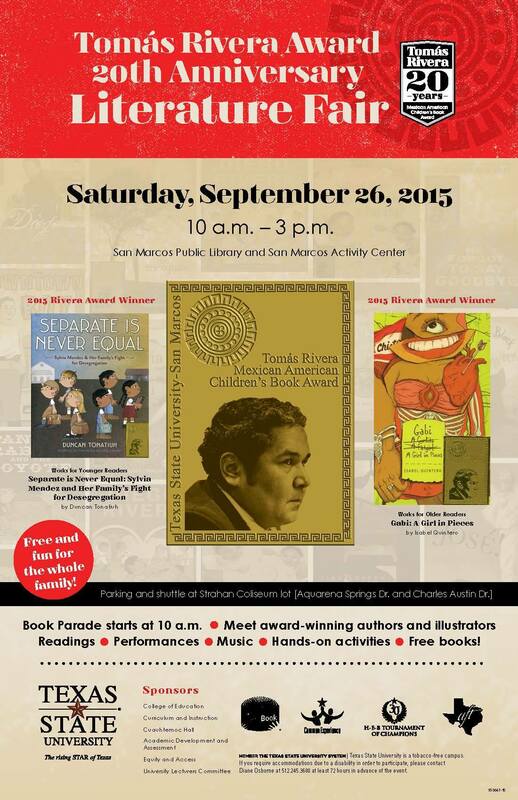 A Book Parade starts the event at 10:00 a.m. followed by readings at the library and activity center at 11:00 a.m. Meet over ten Tomás Rivera Mexican American Children’s Book Award winning authors and illustrators, including Duncan Tonatiuh, 2015 winner for Separate is Never Equal. We will be book tabling at this righteous Tomás Rivera Award 20th Anniversary Literature Fair tomorow, Saturday, 25 September 2015. Please stop by to visit, say hi, and buy un libro!